"why are you working so hard?" he asked, "come into the sunshine and listen to my merry notes." "But the ant went on her work. She said" I am lying in a store for the winter. Sunny days won't last for ever." "Winter is so far away yet, "laughed the grasshopper back. 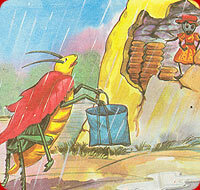 And when the winter came, the ant settled down in her snug house. She had plenty of food to last the whole winter. 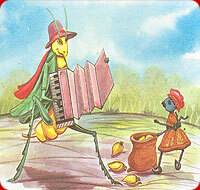 The grasshopper had nothing to eat so, he went to the ant and begged her for a little corn. "No", replied the ant, "you laughed at me when I worked. You yourself sang through the summer. So you had better dance the winter away." MORAL : Idleness is a curse.